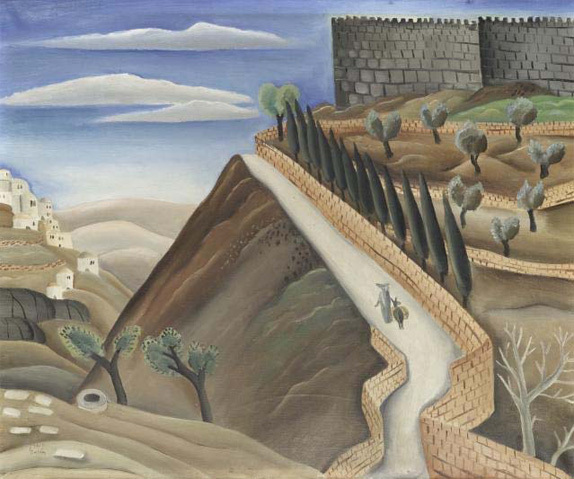 Reuven Rubin, Ramparts of Jerusalem, 1924, Lot 17, est. $200/300,000. © Sotheby's Images. NEW YORK.-Sothebys sale of Israeli & International Art will be held on December 18, 2007 alongside Sothebys annual sale of Important Judaica. Illustrating life in Israel from 1924 to the present, the auction is replete with works from private collections and estates, with strong examples by the leading Israeli artists, including Reuven Rubin and Mordecai Ardon. Additional highlights include a rare offering of works from Marcel Jancos Dadaist period. Prior to the auction, the works will be on view in Sothebys 6th floor galleries from December 13th-17th. Among the highlights of the upcoming sale is an early painting by Reuven Rubin, Ramparts of Jerusalem from 1924, Lot 17, which is estimated to sell for $200/300,000. The canvas depicts a view of the Old City of Jerusalem with a lone figure carrying a basket on his head, walking beside a burdened donkey along a walled, winding path leading up to the Old City. The bright colors and Mediterranean light contribute to this picturesque scene inviting the viewer to re-live the primitive, Oriental atmosphere of early 20th Century in this holy city. The December sale will also feature a rare group of works from Marcel Jancos Dadaist period, offering four different expressions of Jancos investigation of the components of abstraction. He experiments with three dimensional collages of mixed media superimposed on paintings. Jacno employed Cubist iconography and Cubist principles while creating a personal synthesis which is identifiable as his own to this day. The present work, Grand Collage Dada, Lot 30, is one of the highlights of the group with an estimate of $50/70,000 and illustrates his interpretation of geometric forms by compressing them in an oval framework. A wonderful example of the lyrical abstract work of the New Horizons group can be seen in the painting by one of the groups founding leaders, Joseph Zaritsky. Zaritskys abstract view of the kibbutz landscape is portrayed in Kibbutz Yechiam (Lot 78, est. $60/80,000), in which the landscape is depicted with long, loose brushstrokes and abstract floating geometric shapes intertwined with linear forms and exposed surfaces, which all contribute to the sense of an alternative environment opposite and within which the viewer stands. Israeli contemporary art is represented by Adi Nes photograph, Untitled (Lot 106, est. $50/70,000) from his series of boys living in Israeli development towns executed in 2000. Based on the artists childhood memories of growing up in the time of the community-rehabilitation programs of Kiryat Gat and on the iconography of Greek mythology, this work reveals life in modern day Israel, rendered in dramatic Renaissance light and shade. Societas Raffaello Sanzio's Hey Girl!